Who Wore What? - Victorian Fashion, Fashion Like No Other! Victorian Fashion, Fashion Like No Other! What interesting Clothes Did The Victorians Wear? When Did Victorian Fashion Start? Why Was Woman's Clothing So Modest During The Victorian Era? Where Was The Heart Of Victorian Fashion? How Has Fashion From The Victorian Era Influenced Life Today? Being poor during the Victorian era was very difficult, with barely enough money to buy food, how did the Victorians even manage to buy decent clothes? Well, most Victorian housewives made their children's clothes for they had learnt how to at a very young age, but even still, poor Victorian families had very few outfit. Most of the clothes poor Victorians wore were often second to fifth hand. Because the poor Victorians belonged to the working class, their clothes had to be practical, clothes you could move around in. Most of the clothes they wore were made from wool or cotton in dark colours for it was cheaper. If you take a look to the left hand side of the page, you will see a picture of everyday male and female outfits, as you can see the clothes looks old, and neither man or woman are wearing anything extravagant. For the most part, Victorians belonging to the middle class actually dressed themselves quite well. Although they still belonged to the working class these Victorians would wear clothes that would be suitable for what ever they had to do. A normal everyday outfit for a woman would look a lot like a long plain tunic with a long skirt and scarf for they had to be comfortable in order to do housework and run errands. Victorian men would likely wear straight legged pants with a long thick skirt or vest. Again, comfortable enough for their everyday activities. 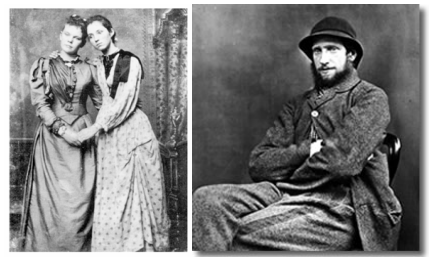 Unlike the lower class Victorians, the middle class had more outfits to pick from, depending on their income. When they attended a party of some sort they would wear their nicest clothes. Especially the woman, for what they wore would signify how wealthy they were. The pictures to the left hand side of this page are very good examples of what the upper class Victorians might have worn. The woman would wear very extravagant dresses with much detail in order to show off their wealth. Woman from the upper class would normally have a maid to dress them for they needed help getting all the layering under their skirt on. Woman from the upper class would often wear gloves and carry around a parasol to avoid getting sunburns or tans for they meant you worked in the fields. Like upper class woman, the upper class men would wear their best clothes along with a top hat which would signify wealth.